Ebony Jessica is quite a beautiful mare who was born and raised here at our ranch. 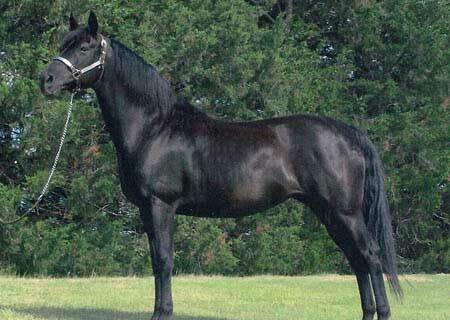 She has had several foals and they all have been black. Her dam, RG Black Sentola, is one of our senior broodmares and has produced numerous very fine foals and Ebony Jessica is living proof of this talent. Ebony Jessica has a great disposition and is very pleasant to be around. Her first foal BMR Ebony Annie sold at the Buckeye Morgan Horse Sale and brought $7200.00. This speaks for itself as what kind of quality that she can produce. We also have her daughter, BMR Ebony Simone, in our herd.